Three weekends ago, Ray Prock, Troy and Stacy Hadrick and I were invited to attend the Fontana NASCAR race as a guest of the Furniture Row Racing Team. 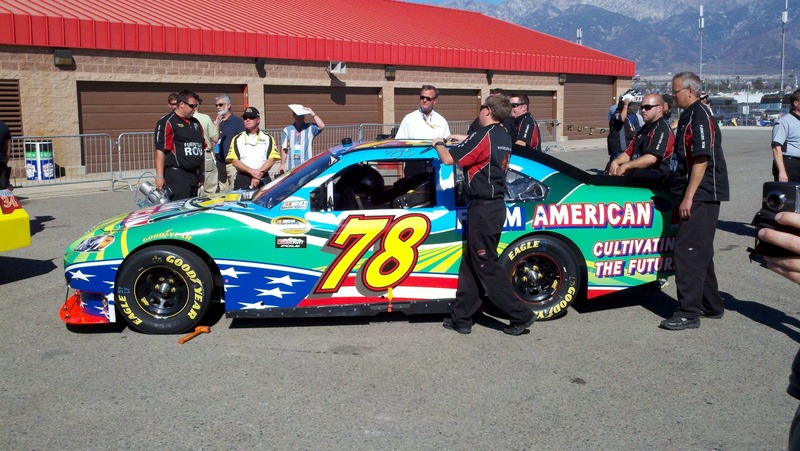 Team owner, Barney Visser, also graciously ran the Farm American paint scheme on the 78 at three races this season. Mr. Visser has first hand experience with the outsourcing of American jobs and does not want to see same happen to agriculture. His passion for American agriculture is obvious and I am excited to work with Furniture Row racing, Ray, Troy and Stacy on his dream to promote American agriculture. It is time for all of agriculture to step up and come together to support an endeavor that will reach over 60% of population, 36 weeks each year through televised coverage, live races and retail store promotion. After catching ‘Undercover Boss’ this week, with NASCAR’s SVP Steve Phelps and Chief Marketing Officer, and witnessing first hand in Fontana, the similarities between NASCAR and American Agriculture are very apparent. 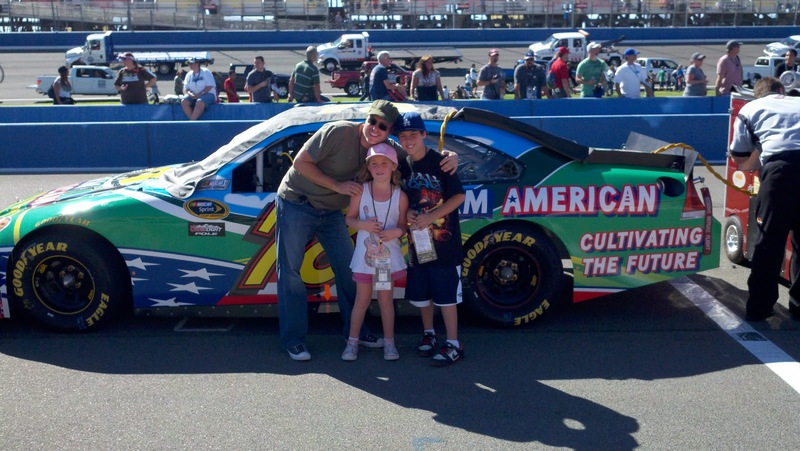 Both NASCAR and American Agriculture place strong emphasis on family values, patriotism and efficiency. The team and partnership are there for the making. Lead by crew chief Pete Rondeau, the #78 team exhibited passion, top skills and professionalism as they performed in the pits, shared attributes of American family farmers and ranchers. Just as dedicated, to keeping American agriculture viable, was the young, promising and truly dedicated driver of the #78, Regan Smith.﻿ Regan is from an agricultural background in New York and shared with us his commitment to doing what he can to further promote American agriculture and keep it viable. Having followed NASCAR for sometime, I can verify that Regan Smith has the perfect attitude, personality and dedication to be the driver of the Farm American car. Hang on! I am just getting to the real exciting part of the vision, as shared with us by Pat Driscoll, Corporate Relations Director and Shawn Martini, Communications Director. This endeavor is more than an outstanding team, a competitive car, a talented driver and a beautiful paint scheme every race day. The goal is to also have a traveling, interactive, educational mobile tour, that will be at every track and make stops between races. This mobile tour will educate the public about American agriculture & promote products grown regionally, based on the track location. Local family farmers and ranchers will interact with the public, build new bridges and grow bigger communities of understanding.Stops for the mobile tour will include tracks, schools, shopping malls, shows and state fairs. The photo above is a prime example of the attraction by the public to the #78 Farm American car. This father and his son and daughter we just walking down pit road, looking at the cars, saw the #78, stopped and asked if we would take their picture with it. A neat conversation about farming and ranching ensued. We need agribusiness, industry organizations, farmers and ranchers to come together on this team of opportunity. Barney Visser, owner of Furniture Row, a man with no ties to agriculture, other than a passion for eating healthy, wholesome, nutritious American grown food, has already invested nearly $2 million of his own to launch the effort. This race season is nearly over and the time is now to step forward and become a member of this winning team for American agriculture. We have been looking for opportunities to reach out to more people, greater diversity and gain positive air time on major networks. How often does agriculture have someone volunteer to help promote our industry at a national level, in a way that reaches over 160 million people? This is it! It is time to become a part of Team Farm American. I would like to personally express a heartfelt thank you to Barney Visser, Pete Rondeau, Joe Garone, Pat Driscoll, Shawn Martini and Charlie Krauch for inviting us to Fontana and including us in this important journey. Excited anticipation for the future of Farm American and Furniture Row Racing is an understatement. Or, send me an email. jefffowle96027@gmail.com and I would be happy to discuss the program with you and get you in touch with appropriate people to become a part of the team.